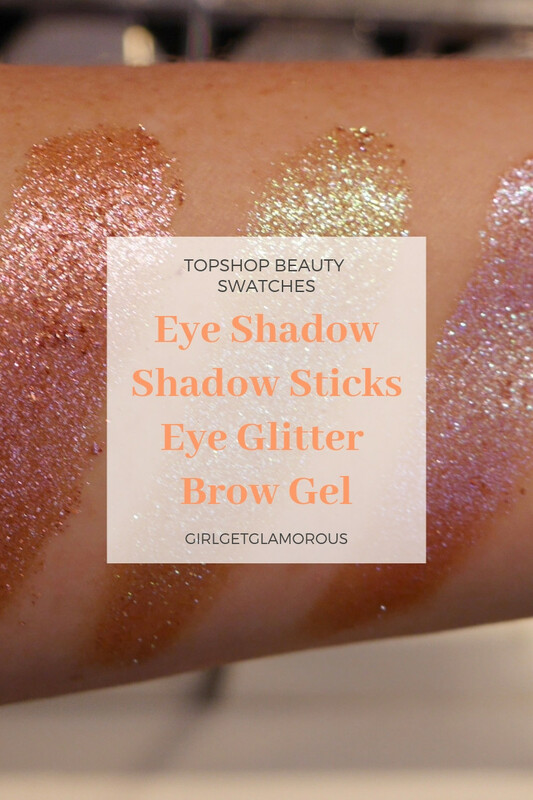 This is part three of my swatch posts for the new Topshop Beauty relaunch! This post covers their chameleon eyeshadows (a personal favorite product) and the shadow sticks, eye glitter shadows, and brow gels. Texture | extremely smooth glide, set within 60 seconds for longwear. Blendable for that minute until set. Packaging | chubby crayon with cap, must sharpen. Chameleon Eye Shadow, $16, available in 4 shades. Texture | smooth, silky shadow with micro glitter particles. These shadows are the Bees Knees, my friends. There truly is not other product like them, they give the coolest duo chrome color flip, while still looking sheer and wearable on the eye. I love them! Packaging | domed shadow in an individual black plastic container with clear lid. Glitter Eyeshadow, $14, available in 9 shades. Texture | Smooth, highly pigmented powder base, with thick bits of glitter. This glitter is slightly heavier and eventually will fall a bit on to cheeks, even with a glitter glue primer (can’t really fight against gravity). Packaging | black plastic square, with clear top. Brow Definer, $14, available in 4 shades (only 3 are pictured). Texture | pigmented smooth gel, sets to dry and slightly stiff. Topshop employee told me it held her brows up all day and has a super strong hold! Packaging | thin tube, amazing micro brush. I hope this post was helpful!! I will do a full review soon. I wanted to do swatches first, because Topshop does not allow returns on opened or used cosmetics, so you definitely want to get the right shade.